When you are working 40 hours a week and attempting to have a social life, plotting out what to have for dinner can become a challenge. I like to pretend I know how to cook, but the truth is I could never toss together a meal from the odds and ends in our kitchen cabinet. What I can do is follow directions very well, enter meal delivery services. There are a few options out there depending on where you live. Two big ones in NYC are Plated and Blue Apron. A friend of mine gave me a free trial for a week of meals at Blue Apron. Blue Apron's service provides 3 meals for 2 people in one delivery for $60. This breaks down to about $10 a meal, which feels a little high for what you get. For me, the value comes from the experience of putting everything together and acting like a chef. 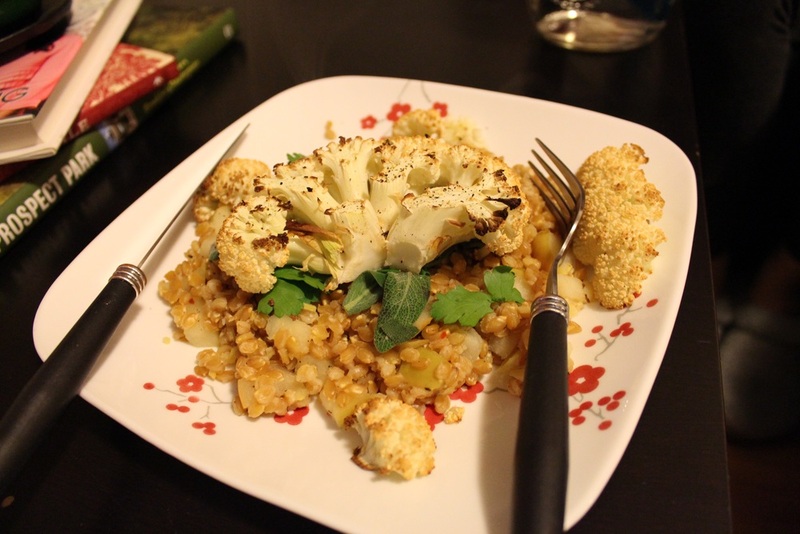 The Cauliflower Steak recipe highlighted here was one of my favorite recipes from Blue Apron thus far. The surprise winner of this dish was the einkorn base. The description below from the recipe card tells a little of the history of the Einkorn. 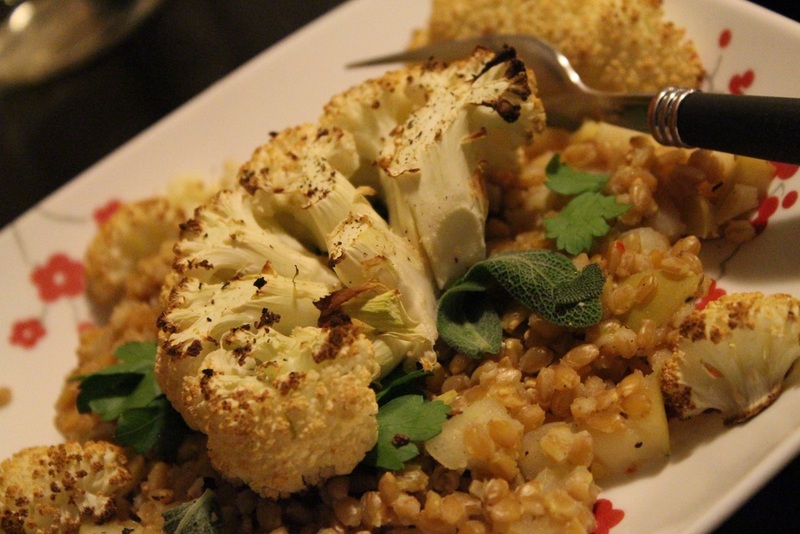 The flavor was a great compliment to the cauliflower and apples. Blue Apron does provide some options that account for numerous dietary restrictions, but they only go as far as providing a vegetarian option. As such the meals can be a little hit or miss for a plant-based diet. This means that I'll make some substitutions for Lacey when the recipes call for eggs, oils, or milk. So far this has worked out well for the meals we have received. The trick is, you need to keep an eye on your email in order to pre-screen next weeks order before they send it out. One of the biggest challenges for me in trying to follow a plant-based diet is the finding the time. Eating plant-based typically means eating more dinners in, but that means more grocery shopping. I'll talk about the pains of grocery shopping in New York and what we do to avoid it, in another post. The weeks I choose to get a delivery from Blue Apron provide a nice break from elbowing people in the produce section of Trader Joes. 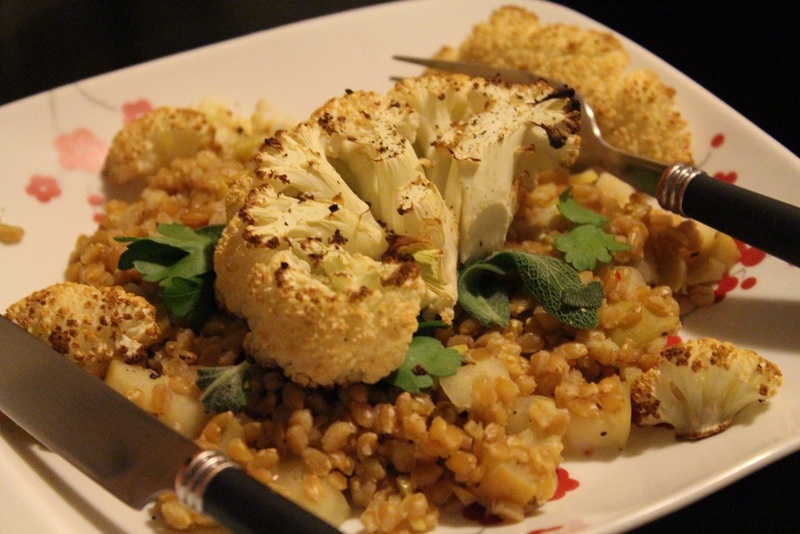 In this dish, you'll use an ancient variety of wheat called einkorn, which has been cultivated for over 9,000 years. Sometime during the Bronze Age, einkorn fell out of fashion, but it survived in the wild. Today it's regarded as a "relict" crop, a species that was once grown extensively, but now is cultivated in small amounts. Let's bring it back! Its delicious, delicate, nutty flavor is the perfect accompaniment for tart apple, crispy sage and hearty cauliflower steaks.